In late spring of 2001, a hobbyist friend sent me four of these beauties. I placed them in a 10 gallon planted tank. Several months passed by and these barbs became more beautiful. The male was a deep reddish orange color; the female was a light yellow with a light cast of orange. One morning, I decided to try for spawn from these beauties. I had lost one, but one male and two females remained. I set up a 10 gallon tank filled 2/3 full and 1/3 aged water. My pH was 7.4 and the water was on the alkaline side. I used a submersible heater with temperature set at 78 degrees. I added a tablespoon of aquarium salt to the tank water. My filtration consisted of a small sponge filter. I planted the tank with Java Moss, Java Fern, Anacharis, and Hornwort. Later that evening I added the pair, turned off the tank light and raised the temperature to 80 degrees. The next morning when I checked on the pair, the morning sun was shining inside the tank. I saw the male driving the female into the java moss. I pulled up a chair and watched the pair for more than an hour. The female was not cooperating at all with the male. She swam to a corner and hid behind the Anacharis. The male would locate her then head for the Java moss. This continued for quite some time. Finally, the female headed for the Java moss and the male followed. He began to nudge the underside of her stomach and she began the barrel roll. The pair rolled throughout the Java moss. When she grew weary, she would hide behind the Anacharis, leaving her corner only to search out the eggs and devour them before my eyes. There was nothing I could do to prevent her quest for her own eggs. Throughout the day, they continued their spawning act. Late that evening, I removed the pair and waited for the eggs to hatch. Three days passed and still no fry. I had seen some eggs being sprayed in the Java moss, so I knew there were eggs. Why were they not hatching? The next few days kept me busy and I almost forgot about this tank. When I went back to check for fry, I found only six free-swimming. I added a small amount of egg layer fry food and later in the evening I fed live brine shrimp. Soon these six small fry had bulging bellies. I knew they would be ok and soon become large enough to be placed in the grown-up tank. I waited a few months and tried another spawn. The fry had grown to be quite beautiful. I wanted more of these beauties. 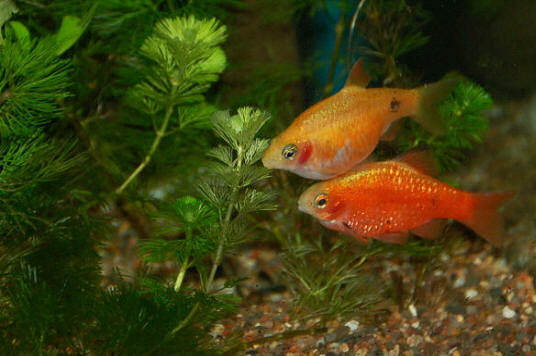 I had lost one of the females from the previous spawning trio and now had only a pair. The spawning set-up was the same as the previous one. The male and female spawned the next day and once again I removed them that evening. I found only four fry from this spawn. What was wrong? I knew my spawning set-up was the same I used for all of my barbs. An important key was missing. I did not know their scientific name; so all my resource books were not helpful. I did learn that some barbs have different spawning methods and egg laying may occur over a period of days. Was this the problem? I separated them and fed them live foods for another month. I was determined to unlock the secret of spawning these beauties. Once again, I set up a spawning tank using the same method as before, only this time I was prepared to take a chance and leave the pair in the tank for five days. I added some more Java moss to the set-up. I hoped they would not eat any fry that may hatch early. After the five day period was over, I removed the parents, placing the male in one tank and the female in another, just in case I would need to repeat the spawn. Three days later, on a beautiful sunny morning, I checked the tank. There were four small free-swimming fry. I was disappointed. I wanted to find many more. Late that afternoon, I fed the fry a tiny amount of live brine shrimp. The following morning, I found three more fry and my hopes went soaring. Would I find more over the next few days? Only time would tell. I discovered more fry during the next week. I had unlocked the secret and now knew why I had such small spawns. Apparently, these barbs only lay a few eggs over a period of days. The next few days I discovered more fry until I counted 28. I had so much Java moss and floating water sprite in the tank, I could not see well enough to find more. Only time and growth would allow me to get the total number of fry.